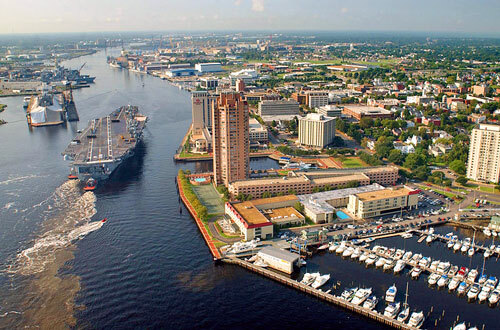 Portsmouth, Virginia is located on the Elizabeth River, a tributary to the Chesapeake Bay. Portsmouth has one of the oldest working harbors in the country. You may see ships passing by the downtown seawall, including Navy ships traveling to and from the Norfolk Naval Station. The Navy plays an important role in Portsmouth’s economy. The Norfolk Naval Shipyard is actually located in Portsmouth and is one of the largest shipyards in the world specializing in repairing and modernizing ships and submarines. The Naval Medical Center Portsmouth is located downtown, on the banks of the Elizabeth River. Portsmouth’s historic “Olde Towne” downtown district is a good place to walk around. You’ll find shops, restaurants, and galleries and museums there. For lodging, the Renaissance Portsmouth, which sits right on the downtown waterfront is a great choice. The Comfort Inn Olde Towne is also popular places to stay downtown. Learn more about things to see and do in Portsmouth, VA – Portsmouth Attractions. This is the large hotel located right on the waterfront in downtown Portsmouth. Convenient historic Olde Town location, within walking distance of shops and museums. Hotels, traveler rated & reviewed at TripAdvisor. Portsmouth is a great place to attend concerts. There’s an outdoor concert pavilion right on the water that hosts top national touring acts, and Willet Hall is the city’s modern performance venue. If you’re into movies, you should go catch a film at the Commodore Theatre, a restored Art Deco theater with a dining area in the auditorium – check out our Portsmouth Entertainment page for details. Portsmouth also has several nice museums, including an excellent children’s museum. You can take the Elizabeth River Ferry from Portsmouth to Norfolk, which is right across the river. The trip only takes about 5 minutes and it lets you off at Norfolk’s waterfront, close to Nauticus, shops, and restaurants. Portsmouth’s waterfront location makes it a great destination for cruising boaters. Slips are available at downtown marinas that are within walking distance of restaurants, galleries, museums, and concert venues. Ocean Marine Yacht Center. Located downtown, right next to nTelos Wireless Pavilion. Slip sizes from 35 to 65 feet and linear dockage for yachts up to 400 feet. Tidewater Yacht Marina. Located downtown, adjacent to North Landing. 100 slips available for transients.